detail from The In Finite Earth (Fire, Water, Air, Earth), 1999. The In Finite Earth symbolizes earth, air, fire and water using four hollow ceramic spheres whose surfaces are encrusted with suggestions of ruins; inside, they contain objects specific to the elements they symbolize (e.g. a heating element in the fire sphere). Different video projections beam down upon each sphere. 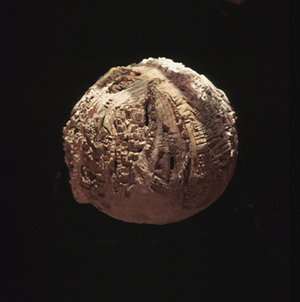 Elizabeth Fisher, in Women's Creation (1975), speculates that the "first cultural device was probably a recipient..." Many theorists feel that the earliest cultural inventions must have been a container to hold gathered products and some kind of sling or net carrier, and here ancient clay and carrier bag technology meets hi-tech in an ecological comment on how we are misusing our natural resources.